I was really upset today when i watched this weeks feature on Yahoo News about crop circles - talk about disinformation!. Basically the video discredits the whole Crop circle phenomenon as it brings up the pathetic Dug and dave arguement again (the 2 men from 1990 who came forward saying they created all the crop circles predating this time). Obviously, someone hasn't done their research at Yahoo or they have been purposely been told to produce this biased work. Don't they know that the public can no longer be easily fooled anymore ?. Its time we look again at the important arguement of determining fake crop circles from genuine ones. Most of the public have forgotten there is valid research which can separate both from each other. As the public have not been told the full story about crop circles they often instantly disregard the whole phenomenon as the work of hoaxers. The media and the hoaxers over the years are responsible for the this biased opinion. Once again, i would like people to remember the point of disinformation - 'to confuse but not necessarily disprove' - when you discredit the topic it becomes confusing and it just takes a few seeds of doubt for the public to drop interest it all-together. This is exactly they want to happen with crop circles, but if you bother to look further and actually study crop circles you find out there is alot more going on here than just pretty shapes. According to Colin Andrews (who coined the term crop circle in 1980) over 90% of current crop circles are fakes, with 10% falling into the range of being classed as genuine. You can argue on this percentage , but the fact is there is a certain extent which can not be explained away by coventional means. With the advent of GPS and plotting decides more sophistated fakes have been able to have be created over the years.Yet still the genuine crop circles return as they have for over a thousand years (previously known as objects like the 'moving devil') , with recorded history going back to 800 AD in Wilshire UK - where the majority of crop circles still appear to this day. Investigators, like Nancy Talbott of BLT Research, who continue to study the phenomenon and produce peer research papers on it, have actually documented crop circle characteristics that cannot be accounted for by men walking through wheat fields with boards strapped to their feet. * Magnetic anomalies inside crop circles. I could go on about this further but i suggest you listen to Nancy's research below and her lectures on 'genuine' crop circles. Similarly, there are many other scientific studys about crop circles underway worldwide and so the phenomenon is not as easily explained away as Yahoo would like you to believe. Google the videos "Crop Circle Ship"
There is something being communicated with us and it looks like blueprints of some kind. Please watch it and post your comments and opinions here. I find it laughable that they debunk it because some guys can make fake ones...just like the one in Paulding County Ohio are classified as a Hoax despite the confirmed reports above. I don't doubt that there are 'genuine' crop circles. When I was a child living in Hertfordshire, I saw quite a few more or less circular areas of flattened crops - wheat, barley and oats - especially after periods of bad weather. 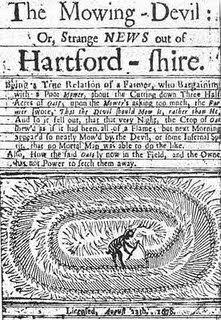 The old 'Mowing-Devil' report (from the same county, funnily enough) refers I suspect to something like this. There are some fairly persuasive explanations for these in the literature. However, I can't see elaborate patterns in fields as anything other than man-made. At their most basic and poorly-executed level, they may be hoaxes or pranks: the more sophisticated ones are rather splendid landscape art, to be enjoyed and celebrated but not, in my view, evidence of anything extraterrestrial or paranormal. Here's an interesting thought and a pretty much guaranteed way of proving who or what makes crop circles. Simply ask our governments who have an unbelievable array of spy satellites, provide the public with the video or photographs of the site before, during and after the formation of the crop circle. It's not like they can deny it given that a field of crops could hardly be seen as a sensitive target. I'm sorry but if you want to stop a rumour you provide absolute evidence. It would cost nothing and stop the whole debate. I suspect it's not done because something is seen that they don't want to share with us.